Recorded history of Buzios does not really begin until around the 1500s. From that period forward to the present this city is rich in stories and folklore that explain the culturally rich heritage of this fascinating fishing village. The French pirates, while sailing along the coastline of Brazil, happened upon this unusual peninsula with its rugged and convoluted shoreline. It was here the pirates came across a very heavy wood that could be used to make bows for musical instruments as well as provide a lovely red dye for clothing and tapestries. Called Brazilwood, it soon became very popular in Europe and made many a French pirate quite wealthy. To get to the Brazilwood, the pirates make friends with the local Tamoio Indians who helped them harvest the trees. These French pirates soon became a thorn in the side of the Portuguese who had now claimed Brazil as their own. While the French pirates were busy sneaking around the coastline of Buzios, the Portuguese were busy exploring and settling Brazil. They quickly discovered the value of the sea and began fishing and diving for seashells which were in high demand. This is how Buzios got its name. Buzios is Portuguese for “diver”. Finally in 1575 the governor of Rio de Janeiro, D’Antonio Salema, launched a campaign to rid his community of the Tamoio and the French pirates. Eradication of the Tamoio and French was not truly achieved until 1615. With peace at the last, the town of Buzios could develop its natural resources, fish. Over time whale hunting became a large industry both in Rio de Janeiro and Buzios. Buzios became the center of whale processing during the 18th century when Rio de Janeiro became to focus on exporting gold to continue harvesting whale oil. As all of the lights of Rio de Janeiro needed whale oil to stay lit, there was high demand for whale hunting and whale oil extraction. After 40 years of whale hunting most of these cetaceans became extinct. 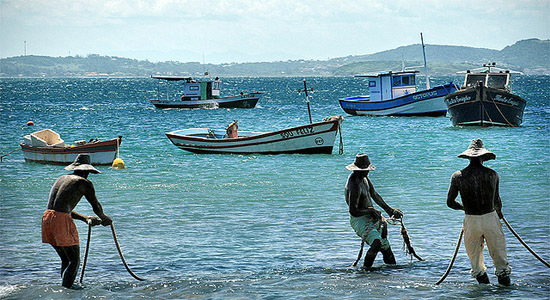 As a result the processing of whale oil died off and the town of Buzios returned to its small fishing village status. In addition the slave trade ended in 1850 and slavery was abolished in 1888. This led to formation of communities made up of newly freed black slaves. Most of the freed slaves formed a community in the Rasa beach area where they became fishermen and farmers. It was not until 1964 when Buzios was launched into the mainstream. Brigitte Bardot and her boyfriend Bob Zagury traveled to Rio de Janeiro for a vacation. Unfortunately, Brigitte was at the height of her career and could not leave her apartment without being overcome by photographers. She finally found some freedom when the paparazzi agreed to stay away if they could share the photos taken by Denis Albanese who was allowed to shadow her. She set sail for Buzios with her boyfriend and her photographer. She loved this little village so much she extended her vacation. She returned again for Christmas. It was not long before the beautiful people of the world followed her example and flocked to this sleepy little town. While Buzios remains a quaint fishing village it still plays host to an influx of visitors who come to swim in its crystal clear waters and relish in the good seafood, good music and good entertainment the city has to offer. Now a popular destination for local Brazilians as well as European tourists, this city manages to retain its old world charm despite its knack for staying in touch with 21st century conveniences. Buzios is a great place to dive. The crystal clear water and the abundant sea life contribuite to the practice and is easy to find certified diving schools where you can get trained, get a guided tour and rent equipment.